My little container garden elicits many comments and questions from folks who visit my home and greenhouse. With that in mind, I thought I would post an update here on what I’ve learned to date and what I’m growing this year. The picture at the top is one half of my garden. I finally located the spot in my yard that receives the most sun. Thankfully, it was a bare spot next to my house that needed a little something to add interest. 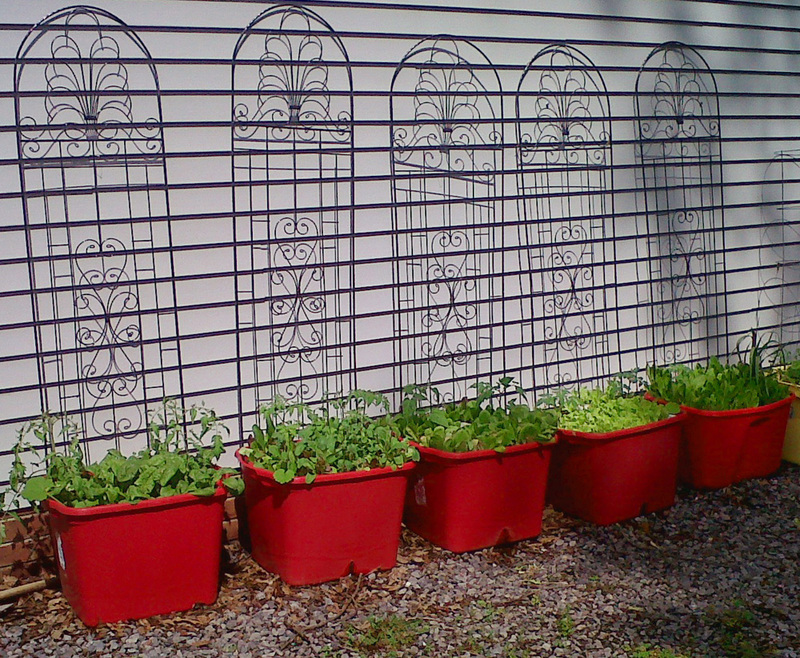 I think the containers and their trellises do the trick pretty well. 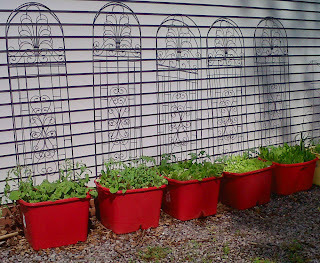 By the way, I found those trellises at Big Lots for $14 each - I bought all they had! My tomatoes will cover them in no time at all. Since all my containers were assembled last year, all I had to do this year was take out the top fourth of the soil and put this in the compost bin. I replaced the layer of fertilizer and topped off with new compost and popped in the seeds. In an earlier post I described the easier way I discovered to put these little gardens together so I won’t go over that here. The other half of my garden is next to my deck; I like things close to the house. If things are too far away, I tend to forget to check on them as often as I should. This spot does not receive quite as much sun as the other but it will be fine for a couple of tomatoes and some squash. 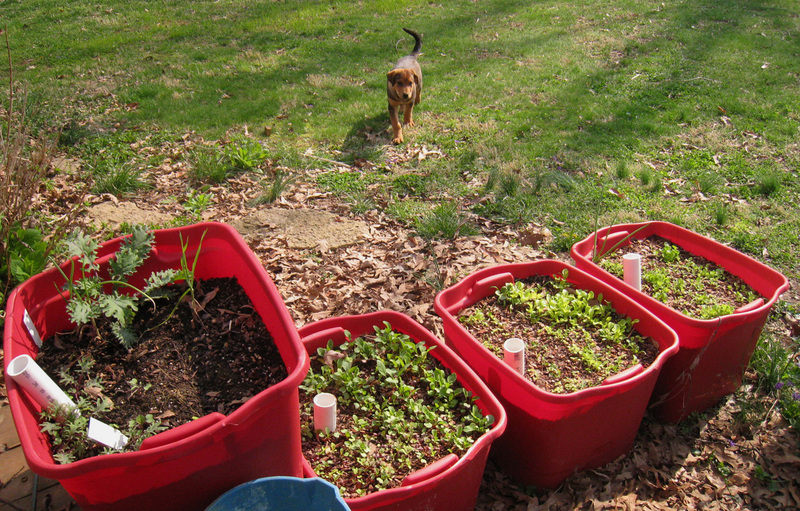 The salad greens (just coming up in this picture) have been very happy there. That rascally dog is one of our new puppies, JoJo. He likes to garden too. 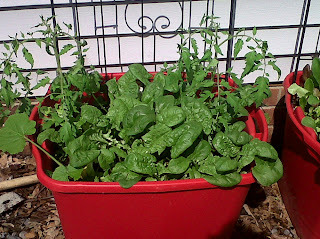 Around the middle of February I planted salad mix, Romaine, Black Seeded Simpson lettuce, Arugula, radishes and spinach in the containers. One container had reseeded from last year so I let it grow. As you can see I have an abundance of salad! I have already added some of my tomatoes and will plant a couple more when the plants are a little bigger. I have found that I can plant several different plants in each container. Because of the layer of fertilizer and the water in the bottom, crowding is not a problem. I will have two tomato plants, a squash and basil in one container. In another I might put tomato, cucumber, marigold or basil. Last year, I tried eggplant, tomato, basil (I like lots of Basil) and squash in one – all were happy. 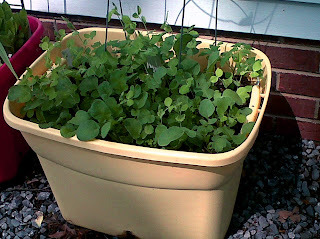 I’ve already planted bush type snow peas into the container with the radish. The radishes will be gone soon and the peas should have plenty of room. The only thing that probably won’t work in this type of garden is corn and vine type beans or peas or maybe okra but I think I’ve heard of small okra types so who knows? 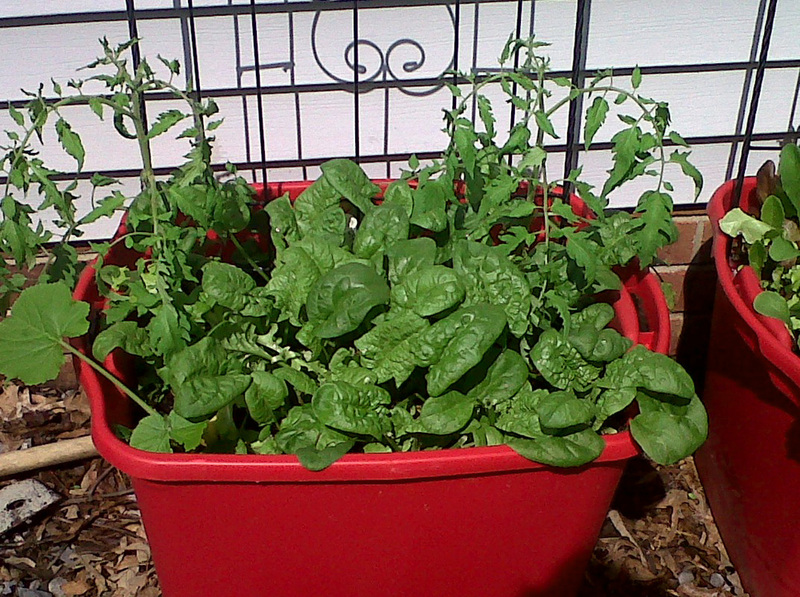 I’d really appreciate your comments about what and how you have gardened in containers. I love this idea. I have a back wall that will be perfect for this. Thanks for sharing!